RhinoNewsgroups is a Giganews Reseller which focuses on entry-level Usenet users.The company offers 200 days of binary retention period to its users where text retention period is 1000+ days. 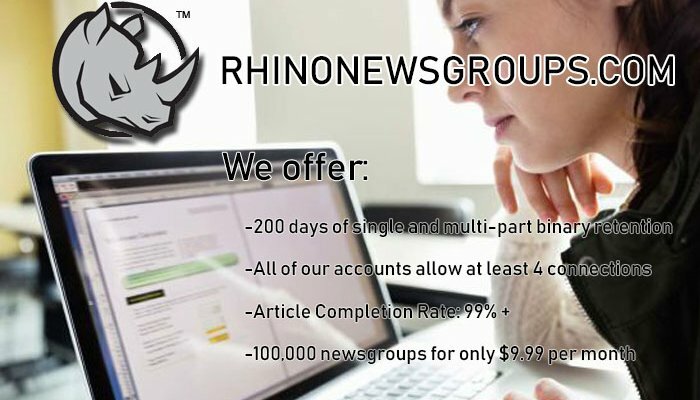 RhinoNewsgroups offer 3 subscriptions plans to its users. 20 GB Rhino is the entry-level package which offers 20 GB downloads per months. The subscriptions also come with eight concurrent connections. This package is available for 9.99 USD per month. Unlimited Rhino is standard package by RhinoNewsgroups which offer unlimited downloads to its users with six concurrent connections. Unlimited Rhino package is available for 16.99 USD per month. Unlimited Rhino is premium package and it is best the company can offer. The package comes with 8 concurrent connections and unlimited downloads. This package will cost you 18.99 USD. The company offers 100,000+ newsgroups and they have their servers in the USA so if you are from the USA you can expect good speed. RhinoNewsgroups offer only 3 payment options. RhinoNewsgroups doesn’t offer free trial period so if you are interested in testing their service you have to pay up to 18.99 USD. We would suggest you check our list of Best Usenet providers as most of them provide free trial up to 7 days. RhinoNewsgroups also doesn’t offer its own Newsreader however you can use any major third-party newsreader with RhinoNewsgroups. The company also doesn’t offer free VPN to its users. You can choose any third party VPN service for very nominal price or you can take service of our best Usenet providers as several of them provide Free VPN and Newsreader to their customers. The company offers 200 days of retention period to its customer where text retention period is 1000+ days. This completion rate is the lowest, its competitor offers 2000+ days of retention period with better completion rate. RhinoNewsgroups offer 99+ retention period, in our tests the completion rate was OK.
RhinoNewsgroups’ users can’t upload anything however other Usenet services including our Best Usenet providers offer this service. The company offers 6 connections to basic package holder and 8 connections to Standard and premium package Holders. In our tests, the connection speed was decent and you will also get decent speed if you are in the USA. The company only provide its support via the form. We contacted the customer support and it took 3 days to reply our ticket. The company’s website also features very basic FAQ section which provides an answer to common questions. RhinoNewsgroups target the entry-level Usenet users by providing 200 Day of retention period and above average download speed. However, the company’s 200 retention period is the lowest when we compare it to our Best Usenet providers who offer 2000+ days of binary and text retention with better speed. The company offers 3 subscription plans where the basic package come with a 20 GB download limit and the standard package will cost you 16.99 USD to get unlimited downloads. The premium package only offers 2 extra connections than standard package, which cost you 18.99 USD which is a lot when we compare it to its competitors where you can get Unlimited downloads, High-speed connections, Newsreader, Free VPN and top-notch customer support for half of the price. The company’s website is also very basic and doesn’t provide much information about the service. Overall, RhinoNewsgroups is OK however our list of Best Usenet Providers offer better deals so in most cases we would recommend choosing elsewhere.